What do axial and radial mean? The easiest way to understand the difference between axial and radial calipers is to picture the front wheel of a bike in the shape of a full disc, rotating on a central axle, which is the case anyway, more or less. The said axle defines the “axial” attribute, while the imaginary lines passing from one side of the disc through the center point to the other side, much like wire spokes do, define the “radial” attribute. These two attributes refer to the direction the bolts used to secure the caliper to the fork are facing. If they are being screwed from one side to the other, horizontally and parallel to both the ground and the axle of the wheel, you’re looking at axial brakes. However, if the bolts are screwed longitudinally, parallel to the forward direction, the bike’s axis, and to one of the spokes or radiuses, then we’re talking about a radial-mount caliper. The same goes for the front brake master cylinder, with the mention that instead of having the front wheel as reference, we are going to use the handlebar or clip-on, in case of a sport bike. Is the piston of the master cylinder moving in a parallel direction with the handlebar or the clip-on? Then we’ve got an axial master, because it moves alongside the imaginary axle of the bars. In case the piston seems to intersect with the handlebars on a direction perpendicular to the imaginary axle I mentioned before, the brake master is a radial one. Knowing the details in this paragraph will help anyone effortlessly tell radial brake components from axial ones. And make a good impression.Is there anything wrong with axial calipers? There is one big answer to this question and it is NO. There is nothing wrong with axial-mount calipers. As I’ve already told you, the difference radial calipers make are smaller than most people with very little knowledge about this matter may believe. 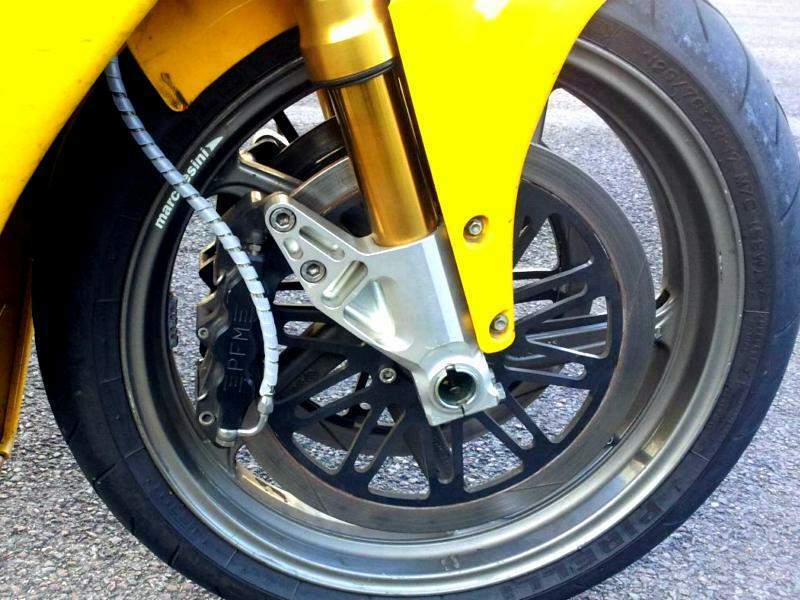 The performance of a bike’s braking system comes from multiple other things, and the method used to mount the calipers is probably one of the least important.Then why do people make and use radial brakes? Initially making inroads into the sport bike world, radial calipers came more as an evolution than a revolution. The main advantage of using radial calipers is that they have a reduced flex, or lateral torsion. This effect is harder to observe during casual rides in or around the city, but when it comes to track racing, experienced riders and mechanics will be able to tell the difference. Rotating the direction of the mounting bolts in a horizontal plane by 90 degrees and aligning them to the forward axis was proved to reduce these flexing forces and add precision to braking in certain conditions. And when it comes to sport bikes, any improvement, no matter how minute, can make the difference between the winner and the rest, so here is how the radial calipers started to become more popular.That’s it? Basically yes, but there is more to the performance of radial calipers, of course. One of the OTHER good things radial brakes brought to the street game was the fact the upgraded design of the calipers and their mounts allowed engineers to reduce the weight of the braking component. The mounts could now be manufactured differently, in cast light alloys or in CNC machined nigh-grade aluminum, but the overall weight of the system decreased. It doesn’t take a rocket engineer to know that less weight is better when it comes to engine efficiency, does it? Even more, since the weight of the wheels, including tires, calipers, pads, and rotors is unsprung, meaning it isn’t supported by suspensions, and this decreases performance and negatively impacts handling. t the same time, due to their constructive differences, radial brakes seem to provide a more even wear of the brake pads. The pads’ wear comes from the interaction between them and the surface of the rotor/ brake disc. The more uniform the piston pressure distribution is, the better and more precise the stopping power will be. The “predictable” character of a bike’s brakes is crucial for a reassuring feeling during the ride, too. The radial mounting of the calipers also provided with engineers and industrial designers with more slack for creating higher-performance units, with more pistons, individual per-piston pads, active pistons (pushing from both sides of the rotor) and so on. 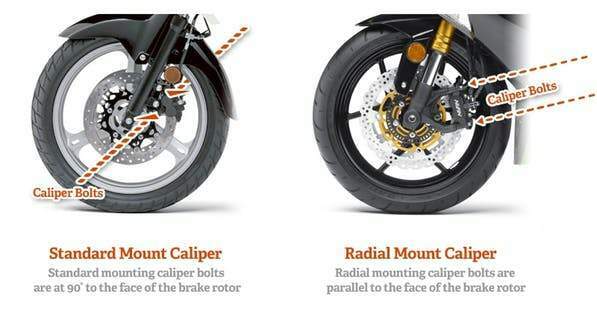 High-performance aftermarket calipers and premium rotors DO make a big difference in the braking characteristics of a motorcycle, but remember that this comes from so much more than the mounting type.Can I get radial brakes? Now, put a big smile on your face, because the answer is YES. Radial calipers can be installed on almost any motorcycle with axial ones. For certain models, aftermarket brake component manufacturers already have custom brackets in stock, which attach to the axial mounting points and are ready to receive the new calipers. 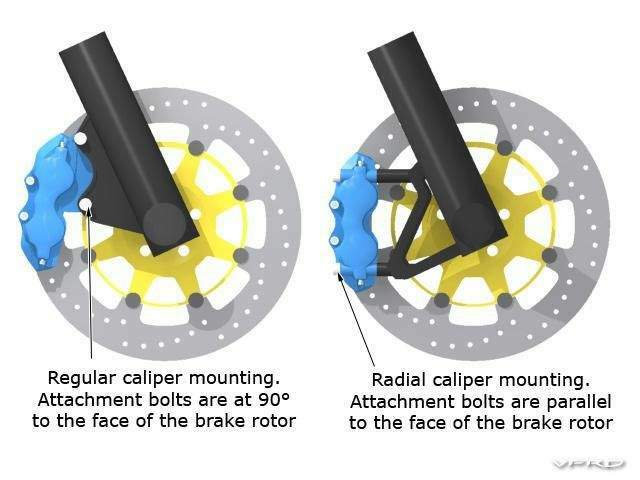 The same goes for the rear disc brakes - they can be adapted for radial calipers, too. As for the front brake masters, the radial design improves the ergonomics and space usage in the handlebar region, provides a more progressive lever action, while offering more adjustability options for the aftermarket levers. The pivot point of the lever moves a little closer to the bike’s center, in the case of the radial master, and this contributes to a smaller momentum exerted on the bars and bike, which is also a good thing. Replacement is rather easy, but you should watch out for the size of the new master. The bigger the size and number of pistons, the bigger the master cylinder should be. Discrepancies between these two hardware pieces will result in inconsistencies in the brake lever feel, sensitivity and control precision.